Sipping my coffee at Schiphol airport, waiting to board the plane. A large cappuccino, and it’s a good one. I need it. It was an early start this morning. Although I normally do not check in more than 2 hours before, this time I wanted to be early on the airport and arrived at 7.15 am, three hours before departure. Just to have time to do some shopping (and disillusion crept in: it’s not cheaper here! Thought to make a world deal with a consumer HD camcorder, but no way, I have seen them cheaper even with tax) and to write a short blogpost. It will take me until Wednesday morning before I will arrive in the Serengeti. 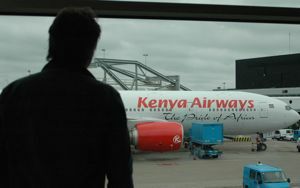 First, Kenya Airways will take me to Nairobi where I will stay over for one night. Tomorrow I will travel to Arusha by bus and on Wednesday morning I will take a plane to Seronera, from which I directly go into the national park to visit the team of Sarah Cleaveland. I am excited. Although I have traveled most continents, Africa south of the Sahara is one of the regions of the world I have never been. And it’s a fantastic project. From more than one viewpoint. Primarily because it’s such a great feel-good project, letting the world know of this lives-saving project, eradicating one of the most horrifying infectious disease, for both man and animal. But not only that. For me personally it is this unique combination of my ‘first’ and ‘second’ professional life: combining my history as a veterinarian with my current life as a new media-maker.